AKW’s range of ActivMotion® Rise & Fall units are operated at the touch of a button. Whether it’s the sink, the hob or even your cupboards our ActivMotion® technology can make any kitchen accessible for everyone. Leading edge actuation technology makes the up and down movements virtually silent and fast moving. The simple and easy to use push button controls can be mounted anywhere along the front of the unit for ease of use and are clearly marked with tactile up and down symbols. 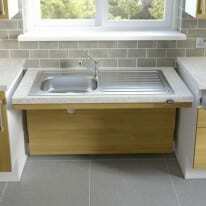 The versatile Rise & Fall table is available in Wall Mounted and Free Standing options and will accept different worktop options, sinks and hobs. With modesty panels available for Wall Mounted units they blend in perfectly with the rest of the kitchen adding functionality AND style. The ActivMotion® cupboard units bring your storage to you. 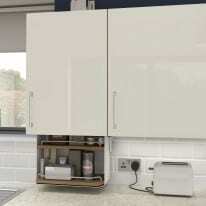 Adding all important storage space to otherwise inaccessible wall units the ActivMotion® Rise & Fall cupboards are Retro fit so can be added to ANY kitchen at ANY time. Operated at the touch of a button to raise or lower the work surface to the ideal height for any user, the ActivMotion® Rise and Fall range helps to create a fully inclusive kitchen environment. Straightforward easy access controls provide complete accessibility. Wall Mounted ActivMotion® enables multi-level working space for inclusive living. 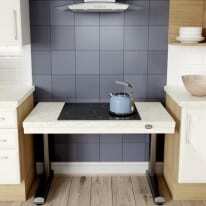 Freestanding ActivMotion® Rise and Fall Unit enables multi-level working space for inclusive living.